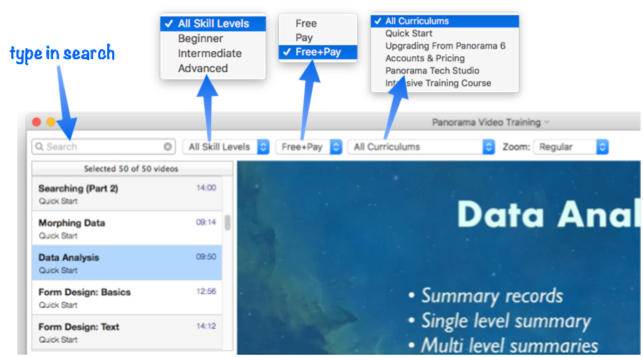 To watch Panorama training videos, choose Panorama X Training Videos from the Help menu. Pick the video you want to watch from the list on the left, then press the Play button. The best way to resize the video window is to choose the Zoom pop-up menu. The Regular size is always 1X, while Large and Extra Large adjust depending on the size of your screen. When you close the window and then re-open it later, it will always come back at whatever size you last selected. Note: You can also resize the video window the regular way, by dragging on the edges. However, when you do that, the window does not automatically maintain the correct aspect ratio so that the video exactly fills the window, so the video may be “letterboxed”, with black bars on the top and bottom, or left and right. If you like, you can open the video in a separate window, or in your web browser (usually Safari). When a video is selected, the lower left hand corner of the window displays a list of help topics related to that video. You can double click any item in this list to open that topic in a new Help window (or single click on the link icon, as shown below). There are quite a few videos available, and the list is growing. You can scroll through the list, or you can search for the video you want. You can also use the pop-up menus so that only a subset of videos is visible. 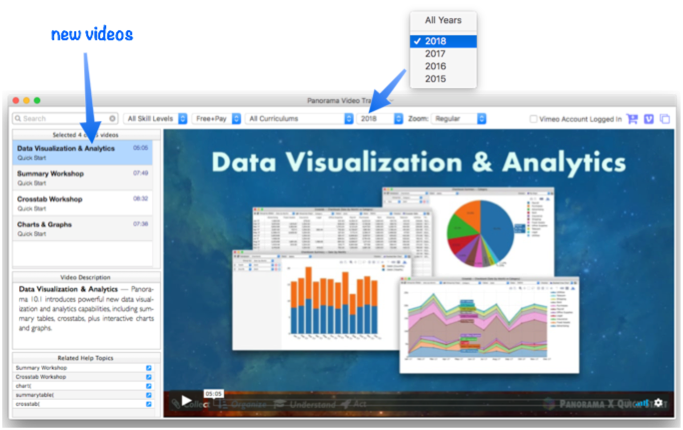 Starting in version 10.1, this window has a new pop-up menu that allows selection of videos by their recording year. This facilitates finding new videos you haven’t seen before. Most of the available videos are free, but some of the longer videos are on-demand and must be purchased or rented. To purchase or rent, you’ll need to join Vimeo. Just go to vimeo.com in your web browser and press the Join button. When you join, Vimeo will give you a choice of plans. All you need is the basic, free plan. The more expensive plans are only needed if you’re planning to upload videos yourself. Once you’ve signed up for an account, you can go to the Panorama X vimeo on demand page to purchase or rent sessions - https://vimeo.com/ondemand/panoramax. To watch your purchased or rented videos in Panorama, you have to log onto your Vimeo account in Panorama player window. To learn more, watch the Intensive Training Course Intro video (free). 10.1 Updated Added pop-up menu to select videos by year they were recorded.